The location of road accidents is not random and they tend to be highly concentrated in urban areas, according to a new UCL study. 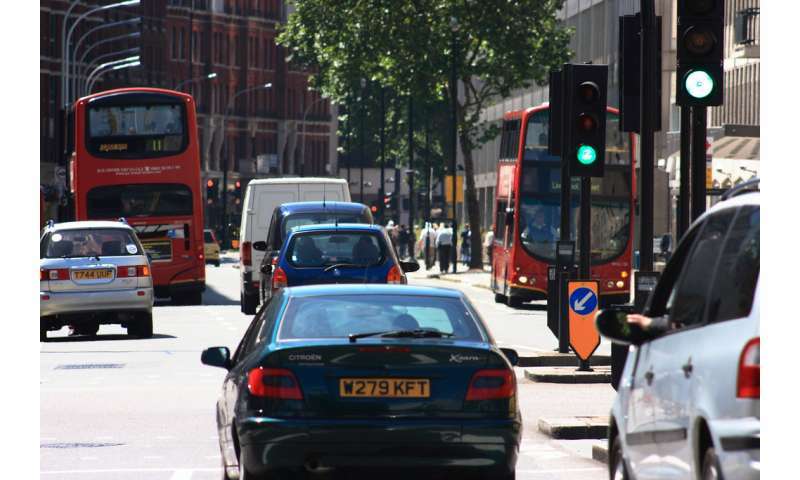 The study, published in the open-access journal Plos One, found that nearly 50 percent of the serious and fatal accidents in London take place in 5 percent of road junctions. Ph.D. candidate Rafael Prieto Curiel, lead researcher (UCL Mathematics), said: "Despite being a rare event, road accidents are among the top ten causes of death worldwide. While significant work had been done to reduce road fatalities in the UK, our research highlights that most fatalities are concentrated to the same few places and that more can be done to improve conditions in accident hotspots." The study examined the location of more than 200,000 road accidents which occurred in central London over a ten-year period, and observed that data against 1,000 accidents that took place over a two-year period on motorways connected to Mexico City. Transport for London figures show that 70 percent of road accidents occur in central London, and the researchers in this study found that car crashes in central London were highly concentrated to specific locations, such as the area nearby underground stations Camden Town and Elephant and Castle, where a road accident is expected every six weeks, and a person is severely injured or suffers a fatal accident every year. This suggests that the environment, such as poor lighting, road surfaces or road layout, increases the likelihood of car crash. In contrast, they found that the location of motorway accidents are more dispersed. The statistically random location of motorway accidents suggests that human error or a car malfunction for example, rather than an environmental factor, increases the likelihood of a car crash. Prieto Curiel added: "We have developed a tool which allows city leaders to detect the concentration of road accidents. If accidents are more concentrated in just a few locations, it might be that the environment and the conditions of those junctions increase the risk of suffering more accidents. "In the case of London where much of the road accidents are concentrated to central London, this evidence might be used to justify the plans to transform Oxford Street, one of London's roads with the highest accident rate and the highest number of road fatalities, into a pedestrian street." The study used a new metric, the Rare Event Concentration Coefficient, to measure the concentration of road accidents based on mathematical model that was applied to two types of road incident data: urban and motorway environment. The researchers consider that by applying mathematics and statistics to different problems which are frequent in a city, such as crime or road accidents, it is possible to design better policies and improve the quality of life. Although the number of deaths caused by a road traffic injury per 100,000 people have been reduced in Europe and North America, they have been more fatalities during the past 15 years in Latin America, South Asia and most of Africa. Each year, a population the size of Glasgow is killed in the world due to road accidents. Professor Steven Bishop (UCL Mathematics) said: "The methodology we use in this study provides the ability to compare between different periods or types of accident to determine the impact of a safety program. Our study can also be adapted and applied to other locations across the UK and globally."